A knit-along for Latvian mittens, mostly, or whatever colorwork project you like! "Walk Like an Egyptian," "Walk This Way," even "King Tut" are all suitable knit-along songs. This knit-along has been very, very quiet of late -- and I'm sorry. I guess mittens are not my warm-weather project of choice -- and apparently not yours, either. I can't remember the last time I saw a current WIP mitten in all of blogland! Soon enough, cool weather will return in the Northern Hemisphere and we won't be able to knit them fast enough! 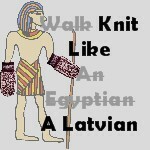 I just wanted to mention that I've formed a Knit Like A Latvian group on Ravelry. I sent invites to all I could find. If I missed you, please look it up and join. If you're not a member of Ravelry, check it out and get your name on the list! There's no need for a blog, just an interest in knitting (or crocheting) and connecting. It's really a fantastic resource. All of a sudden, I'm in baby knitting panic mode, and that's likely to continue until August 9th (my sister's due date). What have you all been up to? I finally have a start to my Latvian mitten. I love the colors and the cuff pattern so far. I enjoyed learning how to make the fringe and braids. Both are new techniques for me. Only one problem. It is gigantic! Off to the frog pond for me. The next version will be knit on smaller needles and fewer stitches. I don't want to trim too much though because I like the main pattern just the way it is. Oh well, it won't hurt to get more practice on the fringe and braid. These definitely have rookie mistakes. I have been wanting to join the fun over here, but the road to Latvian mittens has been a slow one for me. This is the yarn I have spun so far for my mittens. The steel blue yarn is from some delicious wool/alpaca roving I got from Jessie at A Piece of Vermont. I have more of her roving in natural on the wheel now. The grays are a blend of wool and alpaca I made on the drum carder. They will be my accent colors at the cuff. I am thinking about using this pattern. Hopefully, I'll have enough yarn to start swatching in the next day or two. I am thinking of using the blue as the background color and the white for the pattern which is the opposite of what the book shows. Do you think that will look odd? .. from the District of Latgale. The instructions are very well written. And encouraging. Ms. Upitis promises me to "...take heart!...with the passing of rows, the interest in the design grows." And when I finally finish the sets of braids, "the rest of the mittens seem to fly by." She really wants me to finish these mittens. I have chosen a Dale of Norway yarn, in a non-traditional color combination. I think they will be lovely. Thanks for the Knit Along, Vicki! Latvian mitten in spring... with latte macciato (knitting on the balcony). Latvian mitten in spring... with daffodils. Willi writes that she's "Walking The Line" with the mittens. ; ) The temperature in Berlin has been 18-22C (mid-60s to 70F)! I guess spring has sprung -- and if the daffodils are blooming, there's not much chance that she'll have need of mittens 'til next year! Aren't they fabulous, though? I love that she named the photos "Latvian Spring." She writes: I've made an entrelac stripe, don't know if it would be against Latvian standard design, but I wanted to have a connection to my next work: Lady Eleanor Entrelac Stole! These are not blocked yet. Whoo-hoo! And a Happy Dance! I'm extremely pleased with these mittens, even though the weather has turned warmish here and I probably won't get to wear them until next winter. It's been a really fun knit, and I've gain several new skills: fringe, braids, and stranding using magic loop. I must admit that the fringe was the most difficult. winding the yarn onto my left index finger and then scooping it up with my right needle, extracting my finger (which was sometimes difficult), and pulling through. This leaves the leading yarn on the far side of the fringe stitch, and you have to make sure it's coming through the back in order to start winding your next stitch. It made for slow going. For the second mitten, I tried winding the yarn onto my right index finger, taking the loop off and then knitting it through - this put the leading yarn on the near side of the stitch and ready. That was easier, but it also made the stitches looser. I think the tighter fringe - on the left side mitten, looks better. There is one small error, which I spotted on the left thumb, and didn't care to rip back and correct. I did a row of striped stitches right after the pick-up. That's OK, no one knows but me (and now you). And I've got a baby item to knit for a co-worker - I'm thinking of an entrelac blanket. I've got heaps of cotton-rayon yarn that I dyed ages ago and would like to de-stash. I also have a slip-stitch sweater to finish, and would like to start on Dale Torino 2006 for DH. Thanks, everyone - this has been loads of fun! I've been working -- slowly -- on Mitten #2. There are lots of other projects dancing around in my head and the Spring magazines are starting to arrive!! Selbuvotter: Biography of a Knitting Tradition, by Terry Shea of SpinningWheel.net, is now available for pre-order. Orders placed this month will have free shipping (to U.S. and Canada) for the first copy, and only $2.00 for each additional copy -- the books will be shipped in April. Send Nefertiti an email at vknitorious @ gmail . com if you'd like to Knit Like A Latvian, too!